Christmas is an exciting and hectic time especially when it comes to shopping. 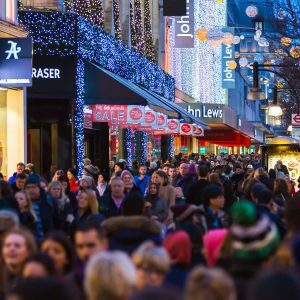 Unfortunately, the festive season is also a time of increased crime particularly in busy shopping areas providing rich-pickings for pick pockets and other criminals! Put cash and cards away safely (not in your back pocket) before leaving the till or cash machine. Try not to keep all your valuables in one place, especially your phone – Should your bag be lost/stolen at least you can still call for help! Use debit or credit cards where possible in place of cash, only withdraw what you need so you avoid carrying large amounts. Shield the keypad when typing your PIN when making payments or withdrawing cash. If you see anything suspicious alert the bank or call the police on 101. Don’t make it easy for thieves by hanging bags on chairs. If you’re having a well-earned break keep your bag and shopping in sight. Keep an eye on your phone, be wary of leaving it behind at tills, coffee shops or dropping it. Make sure the IMEI is registered on Immobilise! Simply dial *#06# to get its unique number. Avoid openly wearing expensive jewellery and watches in crowded/public places. Registering them with photographs and descriptions, plus details of any engraving will help identify them as yours. Park vigilantly in an open, well-lit area. Visit parkmark.co.uk for details of approved carparks (Park Mark is a Police Crime Prevention Initiative). If you must store presents in a car make sure they are out of view and that the car is securely locked. Receipts should be stored separately. Be vigilant – As always please remain alert and report suspicious activity to the police on 999 if a crime is in progress, 101 in a non-emergency or Crimestoppers anonymously on 0800 555 111. Avon & Somerset Police want everyone to have a safe and enjoyable Christmas. Over the Christmas period we’ll be working hard to keep you and your property safe. Please do your bit to help us. After you’ve done your Christmas shopping, if you’ve bought any gadgets for your family and friends then make sure you log anything with a serial number on the national property database Immobilise. This will help us to return your property to you if it’s stolen and will make it harder for thieves to sell on. I also can’t stress enough the importance or downloading and installing tracking software on your mobiles, tablets and laptops. We’ve had some great results recently where people have activated their tracking software as soon as their phone or tablet has been stolen. Not only did it allow us to catch the thief red-handed, it meant the victim got their property back quickly. Whether you’re going away for Christmas or staying home to play with all your new toys, there are some simple tips you can follow to keep you and your family safe. If you’re going away for Christmas, make sure your house looks occupied. It’s worth getting automatic time switches for lights and radios. Ask a neighbour to keep an eye on your house whilst you’re away – they could park a car on your drive and collect any mail or free newspapers which might otherwise just sit in your porch. Cancel deliveries of milk and newspapers discreetly – don’t announce your departure to a shop full of people. Only tell people who need to know you’re going away and don’t post your holiday dates on Facebook or Twitter. Don’t have your home address showing on your luggage for the outward journey. Only put this on the inside of your cases. Lock the garage and shed with proper security locks. Make sure your tools are locked away so they can’t be used to break into your house. Remember to remove the keys from locked doors and windows and to keep them out of sight in a safe place. Letter box restrictors can prevent thieves from accessing the lock from the outside. Never leave valuables on display by windows or doors, especially those with cat flaps. Keep presents out of sight and don’t leave packaging for new electrical goods on display outside your house – keep it out of sight until the recycling is collected. Keep handbags, purses and wallets close to you and secure at all times. Don’t leave bags hanging on the back of chairs in cafés and restaurants, under tables or in shopping trolleys. We’ve said it before and we’ll say it again, register all your gear on Immobilise! Come to one of the local registration events going on across Avon and Somerset, where your local neighbourhood team can help you to register your property on Immobilise. You can also speak to them about any issues you might have and get general crime prevention advice to help keep you safe this winter. Visit the local pages of the Avon & Somerset Police website to get details of your nearest event. 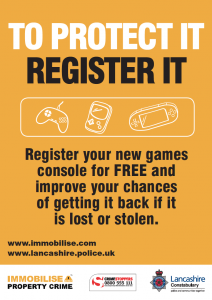 In the run up to Christmas, Preston Police are encouraging members of the public to register their new xbox games console or PS4 on the national property register via www.immobilse.com, as soon as they’ve purchased them. Approximately 340 games consoles have been stolen as part of thefts, robberies and burglaries in the last 12 months, across the whole of Lancashire. Very few are recovered as victims are unable to distinguish their property with serial numbers or unique markers. People are starting their Christmas shopping and games such as xboxes and the new ps4 will be very popular. The consoles are highly desirable to thieves as they are lightweight, portable and easy to sell on. Registering the items on www.immobilise.com improves your chances of getting it back if it is lost or stolen. www.immobilise.com can be used by members of the public and businesses to register their valued possessions or company assets and is used by all UK Police forces to trace owners of lost and stolen property. Preston City Neighbourhood Teams are working with all city centre retailers stocking the consoles, who will be distributing literature upon purchase as well as displaying ‘To Protect It, Register It’ posters. The York Press has reported that residents worried about their property being stolen are being invited to register their items on the Immobilise National Property Register to make it easier to return stolen goods to their owners. City of York Council is urging people to register their property free of charge using new technology invested in by North Yorkshire Police and the Safer York Partnership during the week-long national campaign. The authority teamed up with police to provide £36,000 to fund the Hermes and Apollo kits. Hermes allows the police and other organisations to upload details of property by recording identifying features, size or serial numbers, which can be retrieved from the Immobilise National Property Register that the police are able to access securely via the PNC and numerous other interfaces. Apollo is a hand-held scanner which the police and PCSOs can use to scan an item, store its data on the National Mobile Property Register and retrieve the information when suspected stolen goods come to light. The eleven sessions for the public are being held so people can either have small items such as smartphones or laptops registered, or can bring details – including photographs – of valuable furniture or serial numbers of bikes, for example. Safer York Partnership is keen to use innovative technology to deliver more effective and efficient responses to tackling crime. By taking a few minutes to register their property on Hermes and Apollo and pick up security advice, residents can not only help prevent their belongings being stolen in the first place, but can be assured that if something is stolen, they are more likely to get it back. Often the police recover items during searches or by other means, and it’s not always clear if those goods are stolen. By using the Immobilise register, they can find out instantly. This not only saves officer time, but helps progress investigations and means the rightful owner gets their belongings back. The sessions will take place at the council’s West Offices, in Station Rise, on the 19th and 20th November, between 9am and 3pm. There are also sessions at York Explore library, in Library Square, on Friday 21st from 1pm to 5pm, and on Sunday 23rd from 11.30am to 2.30pm. There will also be sessions at York University Library from today until Friday, 9am to 3pm, or at York Art Gallery, on Saturday and Sunday, from 9am to 3pm. 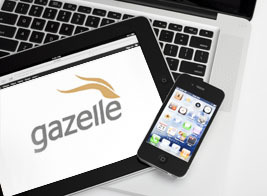 Gazelle, one of the USA’s leading high-end consumer trade-in sites, today announced it has deployed CheckMEND, a cutting-edge tool, designed to more accurately detect potentially stolen goods, including smart phones, tablets and computers. Developed by Recipero, CheckMEND is the largest World’s largest consumer electronics background report service, the system compiles data from all major wireless carriers and law enforcement entities across the USA, providing the most complete database of devices available. Gazelle is the first consumer electronics trade-in site to deploy CheckMEND and collaborated with Recipero to tailor the product to help address the growing incidences of consumer electronics theft. For Gazelle the introduction of CheckMEND comes at a good time with the proliferation of high-end consumer electronics theft. In fact, New York City’s police commissioner recently reported that Apple products now represent more than 40 percent of stolen property in the city and San Francisco police report that nearly half of all robberies in the city in the past year have been cell phone related. said Israel Ganot, CEO, Gazelle. We always take security very seriously. With the CheckMEND deployment, we’re taking this to a new level, committing not only to the protection of a customer’s personal data when we receive the device, but also going the extra mile to ensure that any devices we accept are being sold by the rightful owner and to discourage and prevent theft of consumer electronics. Recipero’s CheckMEND service makes it possible to do a more thorough screening by checking a vast set of carrier and law enforcement sources for a much broader set of consumer electronics. CheckMEND is capable of comparing each inquiry against more than 150 billion records of information, including more than 50 billion items. For more information please visit the following websites. Lincolnshire Police say: If You Love It, Log It! 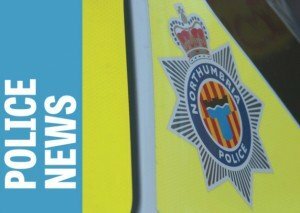 As Christmas approaches, Lincolnshire Police are urging people to log their expensive gifts and precious belongings on Immobilise.com, the world’s largest free register of ownership details. Any item can be registered on Immobilise from small pieces of jewellery to plasma screen TVs and it is especially popular with people wishing to register mobile phones and bicycles. The system records serial numbers and also allows the user to upload a photo and description. The database is linked directly to police systems, enabling officers to trace the owners of recovered property and to also identify the item as being stolen if found in the possession of a suspected thief. This ability to link suspects to a crime via the database means that Immobilise acts as a major deterrent to criminals. Burglars and thieves know that there will be rich pickings to be had in the post Christmas period and the use of the Immobilise database is a valuable addition to your crime prevention precautions. You can register as many items as you like, and then if they are lost or stolen you simply log back on to register them as such. The police can check any property they recover, whether that be from raids, routine checks on second-hand dealers or items brought into custody and, if they find anything that is listed as stolen, not only will you get your belongings back, but the thieves can be brought to justice. We want to send a clear message to those potential thieves that anything logged on Immobilise is too hot to handle. By registering your property and marking it as such, Lincolnshire residents can take steps to ensure they are much less likely to become a victim of crime. 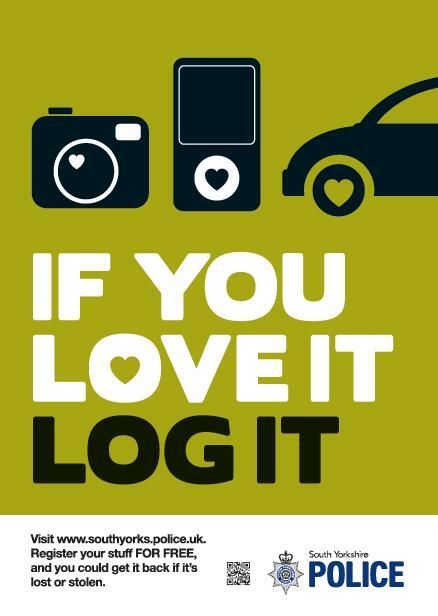 South Yorkshire Police are advising people: ‘If you love it, log it’. In a countywide crackdown on theft and burglary, police are urging people to log their expensive Christmas presents and any other precious belongings on immobilise.com – the world’s largest FREE register of ownership details. In a time when police resources are getting ever more stretched, the police are looking to focus their efforts on crime prevention, with this campaign aimed at preventing thefts happening in the first place – a more efficient way of protecting the public. And in addition to acting as a major deterrent to criminals, the big difference with Immobilise is that as well as getting your stuff back if it’s lost or stolen, the system helps to catch the thieves as well! The database is linked directly to police systems, so when officers recover any property, for whatever reason, they can check it against items logged on Immobilise. For example, if someone arrested on suspicion of drunk and disorderly has your stolen mobile phone in their pocket, police will also be able to link the theft to them as well – but only if it’s registered! Any item can be registered on immobilise. The easiest items to log are electricals, or anything that has a serial number, but you can even log jewellery or ornamental items using the photo upload and description functions. You can register as many items as you like, and then if they are lost or stolen you simply log back on to register them as such. The police can check any property they recover, whether that’s when a person is brought into custody for any reason, property recovered from criminals in raids, or even during one of their now routine checks on second-hand dealers. And if they find anything that is listed as stolen, not only will you get your belongings back, but the thieves can be brought to justice. Part of policing involves stopping crime happening in the first place. The public can play a huge part in this by protecting their property with Immobilise, making items easier to identify and less attractive to thieves. We want to send a clear message to those potential thieves that anything logged on Immobilise is too hot to handle. As a member of the South Yorkshire public, by registering your property, and marking it as such, you are much less likely to become a victim of crime. To support the campaign, police are distributing packs to the public to make the process even easier. These include a selection of stickers to mark all your items as logged, so as to deter criminals, and an information leaflet to explain the process. The packs are available from your local police stations in South Yorkshire or from South Yorkshire branches of Curries, Dixons and PC World. In addition, safer neighbourhood team officers will be out and about in public places offering packs and advice to members of the public. Visit www.immobilise.com to get started.